As you can see, I want to change points on the graph (every time it finishes 'some complicated computations') - this change is in the thread invoked by me in another class. My problem is that this whole concept is not working. It throws 'Series index out of bounds'-IllegalArgumentException, 'index out of bounds' - of some library inner arraylist etc.. I'm not using DynamicTimeSeriesCollection because I need the X axis to be the number of my inner iterations not the time period, and also update when 'some computations' are finished not every some time period. Can you tell me what I'm doing wrong? Or is there a better way to update/refresh the graph? Your snippet is incorrectly synchronized; you should update your dataset from the process() method of a SwingWorker, as shown here. Instead of a DateAxis, use a NumberAxis, as shown in ChartFactory.createXYLineChart(). Addendum: This variation on the example cited plots the worker's progress on a line chart. 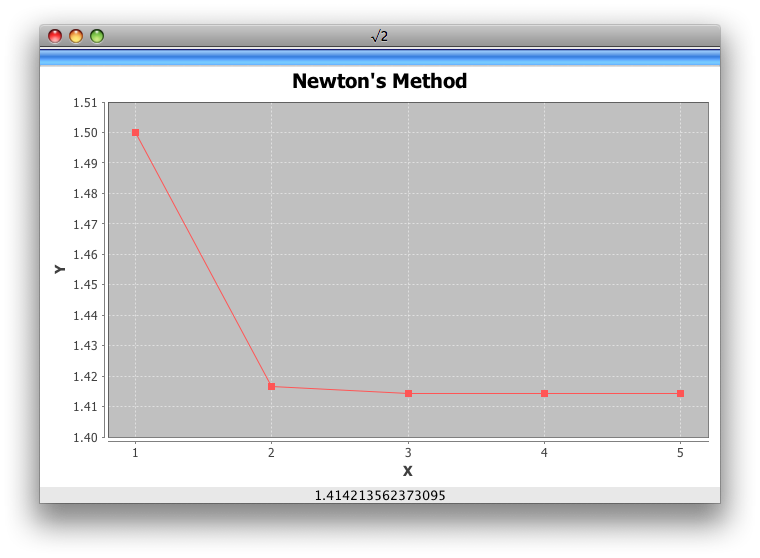 Note that createXYLineChart() uses NumberAxis for both domain and range. Not the answer you're looking for? Browse other questions tagged java swing concurrency jfreechart or ask your own question. How to make a dynamic graph that can accommodate readings of only 30 seconds? Can a progress bar be used in a class outside main? How to refresh a JPanel?